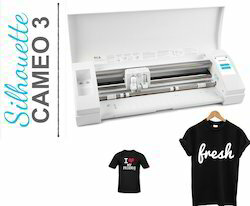 Our product range includes a wide range of silhouette cameo 3 plotter, epson l1800 a3 sublimation printer, epson l805 sublimation printer, epson l130 sublimation printer and sublimation printer. We have recently launched Silhouette Cameo 3 Plotter to match customers increasing demands of customized cutting options. Cut wirelessly with bluetooth functionality.See the dual carriage for blades, pens, markers and other tips which will allow to multi-task in one pass. Learn about the self adjusting blade that will change with your media selection in the user software. Explore the storage included within the machine for tools, sketch pens, cross cutter and blades. View the touch screen updates.See how Silhouette America raised the bar with Cameo 3 by giving 2mm clearance for cutting materials and media allowing you more options to cut and then use their deep cut blade. Includes Silhouette Studio 4.0 with a simpler interface, easier tracing tools, help tutorials and floating panels to toggle between. Also find within the software smoothing slider, cut time estimates, improved tracing and MORE. In the process of continuous effforts of adding more valuable products to serve our esteemed clients with better technology, We have added a series of Printers and Heat Press Machine That provide excellent results. our state od art new A3 Size Sublimation Inkjet printer gives best results on Fabric products and Sublimation Coated Non Fabric Products. We at Koncept Sublimation are committed to serve Indian Sublimation industry with Quality and innovative Products. . In the process of continuous effforts of adding more valuable products to serve our esteemed clients with better technology, We have added a series of Printers and Heat Press Machine That provide excellent results. our state od art new A4 Size Sublimation Inkjet printer gives best results on Fabric products and Sublimation Coated Non Fabric Products. Simply Design Image in any Designing Software. Take a print out on Sublimation Paper. Place Print Out on Blank product and use Sublimation tape for sticking. Heat in respective Heat Press Machine for given Time and Temperature. 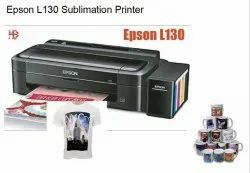 Epson L 130 Colour Single Function Inkjet Printer allows you to experience professional quality printing at your home or office with cutting edge printing technology. This utilitarian printing device allows you to print documents and images with ease. It comes in a slim and compact size that makes it comfortable to keep; while the easy operating measures make sure that you don’t run into any trouble while printing your files. Refilling this printer becomes easy thanks to the Epson-genuine ink bottles. These ink bottles come with clear labelling and drip-free nozzles so you refill without any trouble. Epson L 130 Colour Inkjet Printer achieves professional results thanks to the distinctive printing technology. The Micro Piezo technology ensures that printing is detailed and there is more clarity to every image. This technology captures the complete essence of the document while printing and makes sure that you don’t miss out any detail. This printer comes with Epson genuine ink which gives more quality with every print. 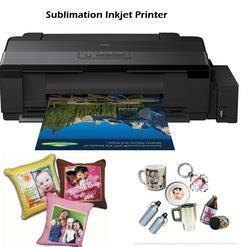 Instead of cartridges, this Inkjet Printer has an integrated ink tank system that makes printing simpler and effective. With this ultra-high-capacity ink tank, you get to print more pages and that too without compromising on the quality aspect. This printer comes with two years of ink which allows you to print 4,000 pages in black and 6,500 pages in colour. Thus, you have adequate ink to complete all your printing demands and don’t have to worry about refilling the tank. The Inkjet Printer from the house of Epson comes with simple controlling features that facilitate ease of access. This Epson printer does not take much time to start and therefore you get your documents printed instantly. With maximum productivity and lesser downtime, you enjoy faster results. The single-function makes this printer different from other traditional printers because it enables you to alter the print settings as per your requirements. The compressed body of this device saves precious space and you get to use this device from any desk. The highly durable body of this printer is capable of withstanding robust use and hence has an extended overall life. Say goodbye to cartridges.Single-function printer with integrated ink tank system for cost-effective, reliable colour printing including two years'' worth of ink. The L130 is ideal for home users looking for quality, ultra-low-cost printing. Featuring a high-capacity ink tank system, users can now print more pages at a lower cost. Simple and hassle-free set up helps you get started instantly to maximise productivity and avoid downtime. Epson printhead technology means the L130 consistently produces high-quality, reliable results. Setting up the L130 is easy and hassle-free so you can start printing straight away. When it''s time to refill the inks, fast top-up technology means the job is made simple and quick to reduce downtime. Epson-genuine ink bottles make it easy to refill the ink tank with their clear labelling and drip-free nozzles. 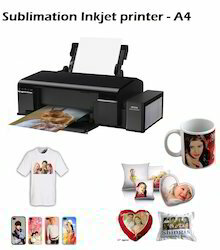 Looking for Sublimation Printers ?